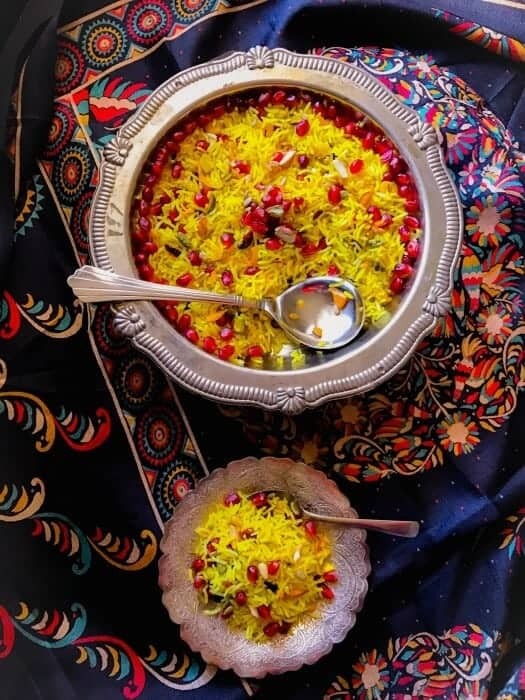 Zarda Recipe | How to Make Zarda | Zarda Pulao: a traditional Indian dessert rice dish that’s aromatic and infused with saffron, dry fruits, ghee, sugar, and rose-water. Zarda, also famous as Zarda Pulao, Meethe Chawal, Zard Pulao. 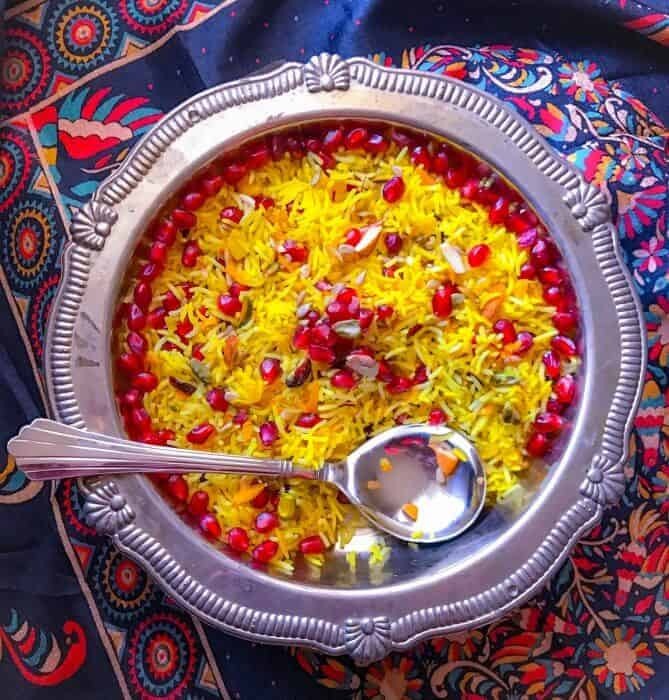 And every bite of this Zarda Recipe or Zarda Pulao feeds not only our taste buds but also the soul. 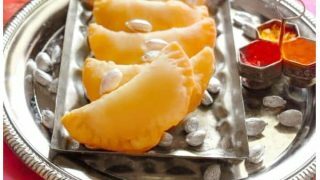 Hello Everyone, today I’m sharing one such traditional Indian recipe that’s specially made for celebrations, be it a festival, wedding or just about celebrating life. 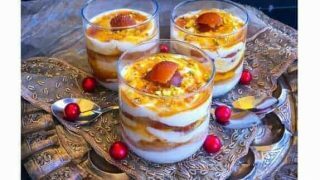 I’ll be making this very shortly for a ‘Festival of Holi’ brunch at our place. As many of you would be aware, Holi is one of the biggest Indian festivals. It’s also known as Festival of Color / Festival of Love all over the world and this time it’s on Monday – March 13, 2017. And every year, I try to cook 1 or 2 recipes that are as colorful as our festival but using all natural ingredients. So, this year, it’s ‘Zarda’, which is actually a Persian word. It means the color yellow and the recipe evolved during the Mughal period in India. 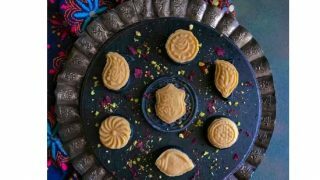 Now, since, it’s a Mughal period dish and like most dishes of that time, it’s also made using lots of ghee, milk, and nuts. But we are definitely going to make a slightly healthier or a lighter version. 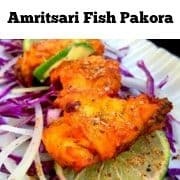 This dish is very popular in the Northern States of India like UP, Punjab, Bihar, Uttarakhand and more. 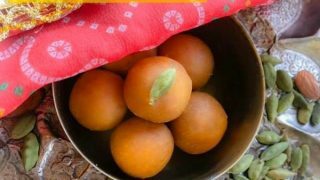 Sweetness (Jaggery/Sugar) – again considered auspicious and supposed to be the first meal in such occasion. So, you can imagine, every wedding that our great-grandparents would have attended, they would have tasted this sweet preparation. I feel it was also popular those days cause there was no electricity or fridge to store sweets (that goes bad easily). 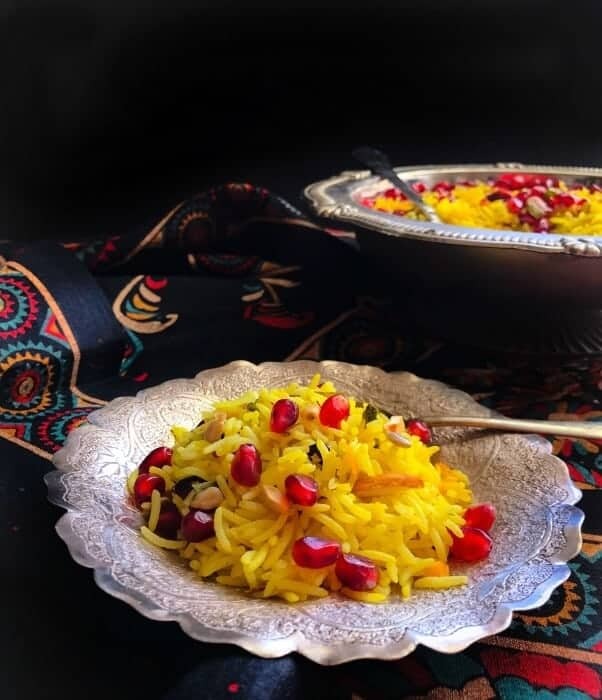 And this Zarda – Indian Sweet Rice Pilaf with Saffron and Nuts recipe can easily be kept outside for 1-2 days. 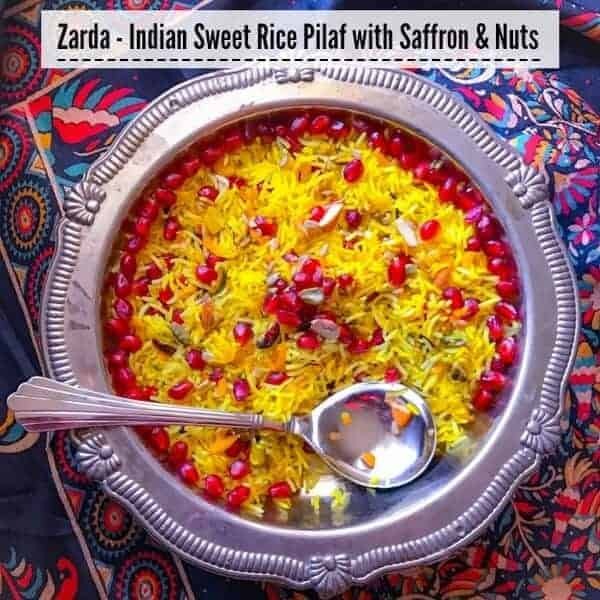 Now, let’s get to the recipe and make this delicious Zarda – Indian Sweet Rice Pilaf. Preferable basmati as that’s whats used in the traditional recipe. But you can use other long grain rice too (I wouldn’t recommend any thick sticky rice as this will turn all mushy). This is one of the core ingredient that adds that rich aromatic flavor to the overall dish. Favorite Nuts + Aromatic Spices. Optional: Rose-water to give it this delicate flowery fragrance and also adds to that fresh taste. Now, that we got everything needed to make our Zarda recipe, I just wanted to add that tad bit more color or pop. Hence, I’m topping it with pomegranate seeds, but you may skip this step if need be or if unable to find pomegranate. you boil the rice in water and saute the nuts separately in the mixture of ghee+milk. Then add the cooked rice to this mixture and cook for 10 minutes. you saute the nuts in ghee, then saute the rice in the mixture, add water and steam till 3-4 whistles. I usually prefer ‘ Method 1’ as it adds much more flavor to the dish and the rice comes out all separate but I’ve cooked using the ‘Method 2’ as well when I’m in a hurry. So pick your choice of method and this festive season or for any of your celebrations, try this ‘Zarda – Indian Sweet Rice Pilaf . Every bite is filled with so much flavor that not only satisfy’s your taste-buds but the soul too. 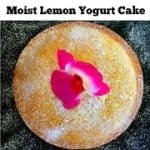 It’s popular for weddings, festivals or special occasions is gluten-free and can be made vegan. 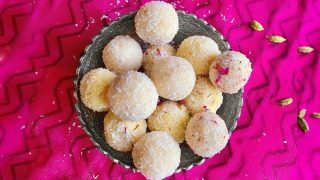 Quick & Delicious #Indiansweets / #Indiandessert Recipes for Holi from Gujiya, Ladoo, Sandesh to Malpua and Eggless Cake. 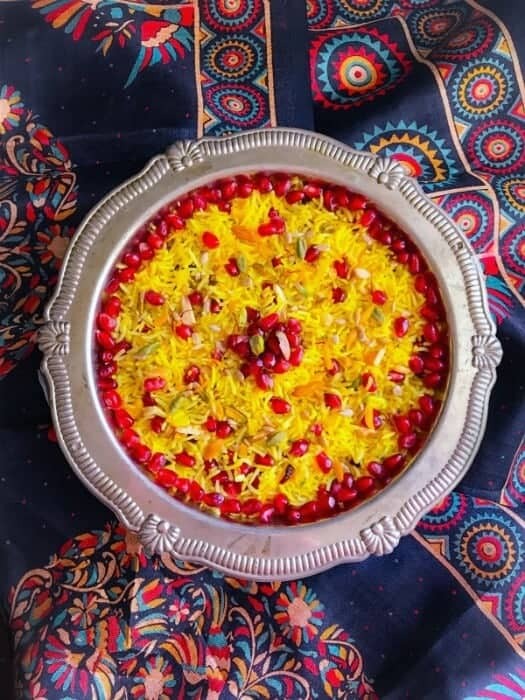 Learn How to Make Zarda / Zarda Pulao which is a delicious traditional Indian dessert rice dish infused with saffron, dry fruits, ghee, sugar, and rose-water. In a large pan (dutch oven), add 3 cups water and place on high heat. Add 1 tsp almond, 3-4 cardamom, 1 clove and rice. Stir this mix and bring to a boil. Drain any water that's left after cooking the rice and keep aside. In a small bowl, heat the milk in microwave for 10 seconds. Then add saffron and let it mix. In a large non-stick pan, heat 2 tbsp ghee. Add cinnamon stick, cardamom, clove and saute for 20 seconds. Now add all the nuts and saute for a minute over low heat. 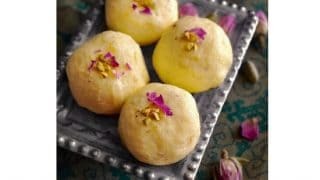 (Once the nuts are heated in ghee, it will dispense a sweet aromatic flavor). Now, add turmeric and saute again. Add the cooked rice and gently mix everything together. Let the rice and nut mixture cook on low heat for 3-4 minutes (keep sauteeing every minute). 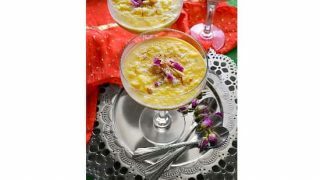 Now, add the saffron milk, sugar and saute everything evenly. Cover the pan and cook for 3 minutes. 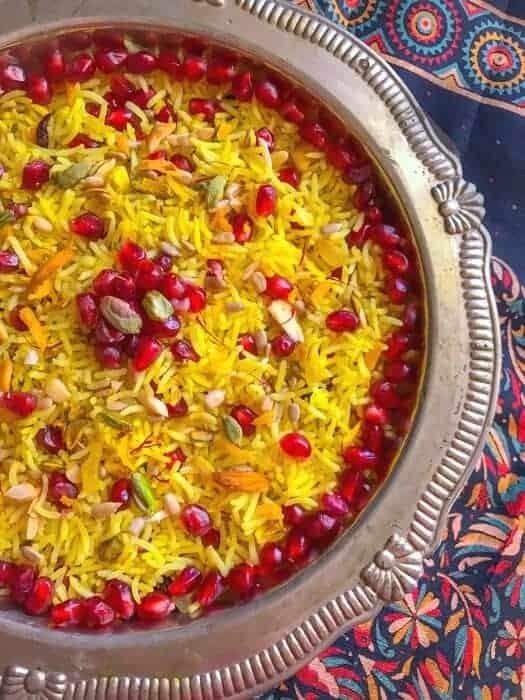 Drizzle the rose water all over the Zarda/Sweet Rice and cover the dish again (let the rice absorb the rose water). Using a fork, fluff the rice and transfer to a serving dish. Add pomegranates and some mixed nuts. 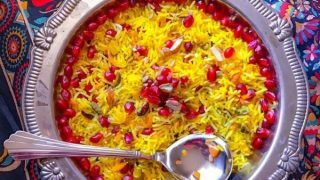 30 Replies to "Zarda Recipe | How to Make Zarda | Zarda Pulao"
Saffron is such an amazing spice. I love it. I never paired it with turmeric… so I’m curious now 🙂 This pilaf looks so sooo good Molly. I can imagine how delicious it tastes. I bet aroma is just perfect! Saving this to try …and pinning off course! Thank you so much Donna. 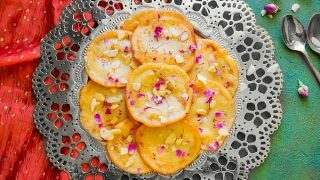 It’s one of my fav recipe for the festival of color (Holi) as it just totally owns the theme and tastes out of this world. 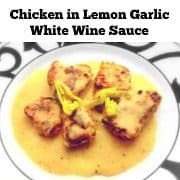 This is an absolutely beautiful dish that will really impress at a dinner party! Love all the fruit and nuts you used! Recipe Saved! Beautiful rice perfect for any day. 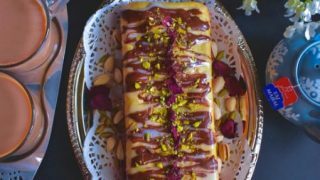 I like that you made it colorful with saffron and pomegranate and rich in nuts. Such an utterly beautiful dish. For me, an English woman, it shows the beautiful colours and vibrancy that I associate with India. I have pinned the recipe and hope to try it soon. 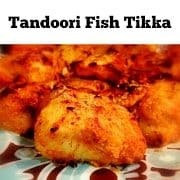 I love Indian food and since hubby go to India every couple of years I get spices from there directly and I still have some saffron from his last trip so with this recipe I now have an idea on what to use it for! Love the crunch from the pomegranate seeds, too! This sounds delicious, but mostly I’m struck by how gorgeous it is! The colors of the rice, the plating, everything. Beautiful!!! How beautiful the rice looks and this would be my husband’s favorite dish. My husband loves the sweet pulao with all the dry fruits and nuts and he orders it whenever he gets a chance. I still have to get my skills together and make the rice come out as perfect as yours. I feel like this rice is tantalizing all of my taste buds right now. I’m not sure what I’m most excited about; the aromatic spices, the saffron or the dried fruit. Molly this dish is stunning! Thanks Megan, glad you liked the recipe. Ok, Molly, the next time I’m in California, I’m coming to your house for dinner, and I want an exact replica of this dish. It looks gorgeous and sounds wonderful. And, extra turmeric for me please, I love the deep yellow colour! What a perfectly colourful dish for the Holi festival. This looks wonderful. Beautiful! I appreciate how you offer two different methods to cook this. The nut mix sounds delicious too! My husband and I have been craving Indian food for quite awhile, now! Definitely want to try this recipe out. Saving for sometime soon! That would be great Christine – Thanks. This sounds so good Molly! And I love that quote about “food for the soul”. I can relate to that. This dish is so colorful and would be great for a special occasion or actually anytime. I have never had a sweet rice, other than in rice pudding. Love the colours of this dish. All the fruit and spices sound wonderful together. We do like rice, so I will have to give this a try. This is a must try! I love rice pilaf but I have never tried sweet pilaf. It sounds delicious. 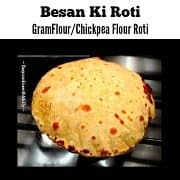 Reminds me of the roti that I used to get at an Indian restaurant in England that had currants in the middle. I haven’t had it here in the U.S.